Afrocentricity International supports the Zimbabwean people who have spoken again that they wish to be governed by the African champion, Robert Gabriel Mugabe. It is time the United States and the European nations cease their efforts to undermine the legitimate government of Zimbabwe. The cabal in the West has tried everything to unseat the heroic Robert Mugabe, who at 89 remains one of the most popular, if not the most popular, leaders in Africa. It is time that the Western nations stop their attacks on Mugabe. 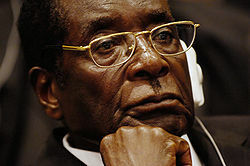 Despite the hostile sanctions imposed by the United States and the EU and despite the attempt on the part of Western corporations and political interests, for example, the conservative think tanks, and others to support the MDC and its leader, Morgan Tsvangirai, the people have spoken in a vote that gave Mugabe 61% of the vote to 34% for Tsvangirai. After suffering through an arranged political marriage with the MDC the ZANU-PF patriots now have the mandate they have been seeking from the masses to continue their drive to gain a majority share of the foreign corporations operating in the country’s critical industries such as mining and farming. Demonstrating to other nations in Africa how to run an Afrocentric government where what is in the best interest of African people is the guiding motto, Mugabe has achieved a kind of political synchrony between the party and the masses that has often been missing in Africa. This is why Afrocentricity International is urging the Obama Administration to cease its attack on one of the few independent African governments. What is the danger that lurks in the political ideology of Mugabe that shakes the American government? Is Mugabe a passionate Taliban of some faith that threatens the rights of Americans? Is Mugabe a terrorist seeking to overthrow the American or British government? No, of course this is not true. Robert Gabriel Mugabe, one of the greatest African revolutionary leaders of the twentieth century, a student of Kwame Nkrumah, and a believer in African agency, has one fault in the mind of Western leaders. Mugabe is an avowed antiracist. This is his crime beyond all else. The politically astute African world understands that the white farmer clique in Zimbabwe has constantly manipulated the Western press and the Western governments into supporting their desire to control the land they stole from the African people more than a hundred years ago. The fact that Mugabe’s government has returned land to the rightful owners and has sought to distribute the vast wealth of his nation to the poor masses has provoked violent reactions from the Obama government and created a blasphemous spiral of vitriol from the American state department. Afrocentricity International condemns the continuation of the perilous sanctions against the freedom-loving people of Zimbabwe simply because the Obama administration has not been able, after two elections, to put a puppet government in place in the country. Morgan Tsvangirai, even with the millions given to him and his organization, has not been able to defeat the aged icon. The reason is clear. Mugabe is the founder of his nation as Mandela is of his nation. Mugabe, unlike Mandela, fought the enemy on the ground as a guerilla leader from his bases in Zambia and Mozabique, and saw first hand the barbarism of the Rhodesian settler regime. It is true that this knowledge and experience, despite his early attempts to reconcile with whites and with the British and American governments that had supported Ian Smith and the minority regime, has made him cautious in dealing with the protector of white racial privilege. The Zimbabwean people have spoken! Long Live the Freedom of the Zimbabwe People! Unity is our Aim; Victory is our Destiny!